This cozy home offers both relaxation and fun times all in one Vacation Rental. The gorgeous indoor Bar with fun light-up accents is a great place to serve drinks and entertain guests. Continue the drinks and hors-d'oeuvres in the screened-in back porch seating area or the Fire Pit in the backyard that lights up entirely. You could also enjoy a candle-lit dinner at the dining table in the screened-in patio, or while seated around the Fire Pit to enjoy the light up views in the Pool and throughout the entire Backyard. After a long day out on the Kayak or the boat, take a dip into the private pool day or night. Pool Lights are available to use for night swimming or lounge around in the backyard and turn on all the lights for ideal night time entertaining. The Spacious kitchen is perfect for meal prepping with the family and right next to the Dining Room where Dinner can be served and enjoyed by all of your guests. With enough seating space for everyone to enjoy some Downtime lounging, the Family Room features an entertainment center with a large TV and cozy couches for a downtime nap. The Queen Master Suite is secluded from the guest rooms for some extra privacy and offers outdoor access to a balcony with Pool and Canal views. Your Guests will enjoy the Queen Guest Bedroom, and the kids/teens can retreat to the Guest Bedroom with 2 Twins. 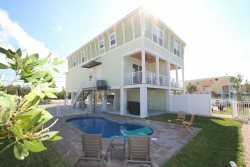 Manatee Haven is a cozy home that offers a charming piece of paradise. The Backyard lights up entirely to set the Keys nightlife mood. Manatees have been spotted in the Canal behind the home many times, offering some fun aquatic life sightseeing. Contact Sandy at 305.432.1193 for more information. Everything was more than we expected. The manatees were a plus. We really enjoyed our stay. Met the cleaning lady on the way out and she was very nice. Loved the pool after spending all day on the boat. The floating dock was a nice amenity. Great spot at the end of the canal - no boat traffic. My personal favorite thing about the place was the very private outdoor shower...only used the indoor shower once. The kids loved the kayaks and all the iguanas - but their favorite thing about the whole house was the piano. It was the first thing they went to after spending all day on the boat...which left the pool to my wife and myself. We all loved the large, screened Lanai for after sunset dinners. Overall, the property was well-kept, clean and beautiful.